ViaSat gambles on future of broadband satellite, hoping to draw rural customers with no access to high-speed Internet service. It's been 16 months since ViaSat Chief Executive Mark Dankberg unveiled plans to build a $400 million broadband satellite – calling it the biggest growth opportunity the Carlsbad company might ever see. And it's been 16 months since the company's shares tanked, falling 29 percent the week after the announcement. Building its own satellite is a swing-for-the-fences strategy that could transform the company but could also strike out. Today, ViaSat has invested $100 million and counting toward the satellite, which is under construction at Space Systems/Loral in the Bay Area. It's on schedule to launch in about 20 months. ViaSat's effort to build its own satellite rests on a theory that is somewhat unproved: Are millions of rural households outside the reach of cable or DSL willing to pay the monthly fee and installation costs for high-speed Internet service via satellite? The answer is not as obvious as it might seem in the Digital Age. Current satellite-based Internet providers have less than 1 percent of the market share of total broadband subscribers in the United States. When the Pew Internet and American Life Project asked households in 2007 and 2008 why they hadn't signed up for high-speed Internet, more than half said they didn't see the point. Price was the second-largest factor for not subscribing. The Obama administration, however, definitely thinks there's a need. The economic stimulus package includes $7.2 billion to give all Americans high-speed Internet access – especially those in rural areas where cable or DSL isn't available. That's why ViaSat and the satellite industry have become more vocal recently in touting their broadband programs. They want to make sure that satellite has a seat at the table with all the other technologies competing for stimulus funds. The monthly cost for satellite broadband isn't much higher than for cable or DSL. It's more the upfront costs. Upfront fees vary, and specials can lower them. But to get satellite broadband service, households need a dish and modem installed. While the equipment can be purchased or leased, upfront costs and installation often range from $200 to $600. Although ViaSat's satellite is nearly two years from launch, the company hopes that ViaSat 1 will benefit from federal programs encouraging expanded broadband access. ViaSat 1will be a new generation of satellite aiming to have a tenfold increase in the broadband capacity compared with existing satellites from competitors WildBlue Communications and Hughes. That translates into faster service for customers. 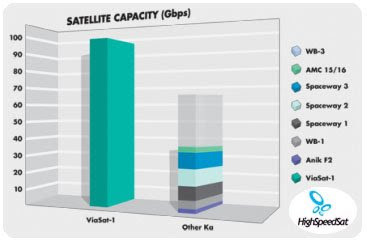 ViaSat1 is proposed at 100 gigabits per second total capacity. It promises to deliver download speeds to Internet subscribers of between 2 megabits to 10 megabits per second. WildBlue and Hughes, the largest companies offering satellite Internet service in the United States, each has about 10 gigabits of capacity. Existing satellite plans offer download speeds of 512 kilobits to 1.5 megabits per second for basic service. Faster speeds are available, but the monthly fees are well over $100. Viasat is proposing to provide just a lot more bandwidth than either of the established services, that's everything in a nutshell about what the differences are. While some Wall Street analysts see promise in ViaSat's satellite venture, it's an expensive gamble. There could be technical delays, which can quickly jolt costs skyward. Moreover, the satellite industry is littered with epic money-burning failures. And it takes years to build a satellite – leaving room for competing technologies such as WiMax or fourth-generation cellular networks to gain a foothold in rural markets. But perhaps the biggest risk is whether demand really exists for high-speed Internet outside of regions covered by DSL and cable at proposed prices. Analysts estimate that 10 million to 15 million households in the United States don't have access to broadband through cable or DSL. Existing satellite Internet providers combined have only 875,000 subscribers out of the 106 million households with broadband. There's certainly not a large percentage (of the population) in US that can't be reached by cable or DSL. Satellite has been available to fill that gap, but the problem has been the pricing has not been attractive. They haven't really established a huge user base. Basically the market is constrained. It seems WildBlue does not have much capacity left in high-demand areas. Neither does Hughes. One question is how big would the market be if you went in with 10 times the bandwidth those guys have? ViaSat believes that it would be much bigger – particularly if it can offer high speeds at roughly the same costs. It expects retail prices for the service will cost about $50 a month for a basic plan, which is competitive with existing broadband services today. The company does not want to sell directly to consumers. It plans to be a wholesale provider of bandwidth to Internet service providers, or ISPs. WildBlue could be a potential ISP partner. So could rural telephone companies and satellite TV providers. Founded in 1986, ViaSat spun out of San Diego wireless pioneer Linkabit. Its bread-and-butter business is making complex communications equipment for the military, such as modems that fit in the nose cones of fighter jets to allow pilots to see data from the battlefield. Eutelsat Communications, the European leader for satellite communications, has launched its revolutionary new Tooway™ consumer Internet access service in the UK making Lord Carter's Digital Britain vision of universal internet access a reality. Using satellite technology available from just £29.99 per month, Tooway™ can now offer the UK's rural homes, and those in slowband areas, access to 2 megabit per second (2Mbps) broadband services without the need for any existing telephone line. Tooway™ can deliver broadband for all, as called for by Lord Carter in the Digital Britain interim report published in January this year. The service is also triple play-ready, allowing distributors to offer additional TV and IP telephony services using the same equipment. Tooway™ will be delivered in the UK via a network of certified local distributors, including Bentley Walker Satellite Internet Solutions, Avonline Ltd in Bristol, Satellite Solutions Worldwide Ltd in Oxfordshire and Remote Data Services Ltd in Perthshire, Scotland. The Tooway™ solution consists of a small satellite dish and a modem connected to the PC via Ethernet, giving customers Internet access following a simple installation. According to Broadband think tank Point Topic large sections of the UK are still without the minimum 2Mbps broadband speed Lord Carter recommends. Around 15 per cent of homes in the East Midlands are currently out of range, as are almost 16 per cent of homes in the North East, nearly 20 per cent in the South West, and around 14 per cent in the South East. The traditional route of extending cable connections capable of running the service to these homes would be expensive and well beyond the 2012 deadline set by Lord Carter. "Tooway will help make Lord Carter's vision for Digital Britain a reality by revolutionising the consumer market for satellite Internet access," said Arduino Patacchini, Director of Multimedia and Value Added Services at Eutelsat. "Tooway™ is able to offer true broadband access with total independence from existing infrastructures. It has the technology and capacity to become the definitive, low-cost solution for geographical areas that are affected by the digital divide." Tooway is the first satellite two-way broadband service offering similar speeds and costs to ADSL. 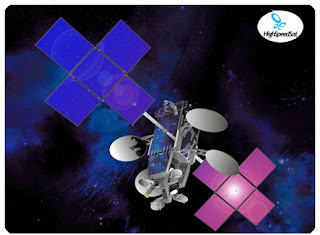 The service is based on Eutelsat's satellite coverage, the commercial and infrastructure operating experience of Eutelsat's subsidiary Skylogic and ViaSat's SurfBeam technology. The technology used by Tooway™ comes to Europe after acquiring extensive experience on the North American market, where ViaSat already provides the equipment and network for over 400,000 homes with satellite broadband access fully independent from the terrestrial network. Today, Tooway™ is already serving customers in 20 European countries including Germany, France, Spain, Italy, Switzerland and Ireland with other countries across Europe rolling out over the coming months. Tooway operates in the Ku-band in the UK. 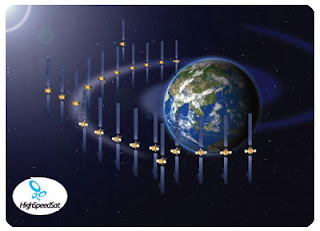 It is delivered using Eutelsat's EUROBIRD™ 3 satellite at 33º East. The service offers two-way satellite access to users without the need for a telephone line, delivering speeds of 2Mbps on the downlink and 256 Kbps on the uplink. 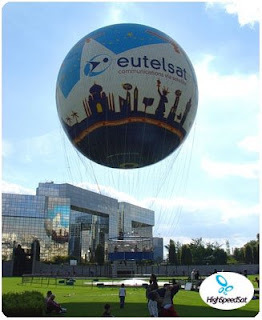 In 2010, Eutelsat will expand the service with additional high speed Internet access up to 10Mbps. These revolutionary broadband speeds will come from the launch of KA-SAT, a dedicated new satellite from Eutelsat, specifically designed for broadband delivery in Europe. The satellite, which has the combined capacity of forty traditional satellites, will enable Eutelsat to deliver Internet access to up to two million European homes at a similar speed, price and quality to that of terrestrial ADSL2 services.